The eldest son of North Korea's leader Kim Jong-il appears to have confirmed reports his younger brother has been designated the country's next leader. Kim Jong-nam, when asked by Japanese broadcaster NTV about whether Kim Jong-un would succeed his father, said: "I think so. I hear this news by media". 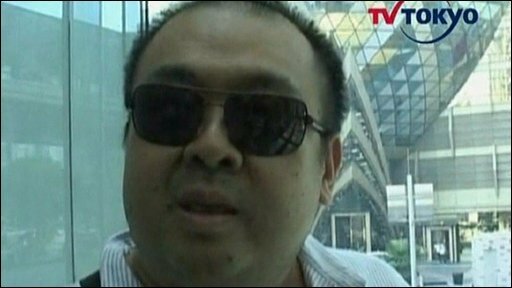 Kim Jong-nam, who denied reports he had defected, said he could not remember the last time he spoke to his father. South Korean media last week said Kim Jong-un had been designated to succeed. In the interview, which NTV said was conducted in Macau, Kim Jong-nam, 37, said in English: "The appointment of a successor is totally my father's decision. "He makes his decisions so he doesn't need to talk to me or talk to another person." Questioned about whether he had been notified by the North Korean government about succession plans, Kim Jong-nam hesitated before saying: "Very sensitive question. I cannot answer." He said rumours last week that he had defected from North Korea in the wake of his father's decision were "a totally fake story". Kim Jong-nam is a regular visitor to Macau and has spoken to journalists there before. South Korean media reported last week that South Korea's spy agency had briefed legislators on the succession. North Korean officials were reportedly told to support Kim Jong-un after the North's 25 May nuclear test, the reports said. There has been much speculation over who would follow Mr Kim, who is thought to have suffered a stroke last year. Little is known about Kim Jong-il's youngest son, who is thought to have been born in 1983 or early 1984. He was apparently educated in Switzerland, but there is no confirmed photograph of him as an adult. As rumours about succession have circulated before, analysts are wary of predicting the next leader. The last succession was settled 20 years before the death of the Great Leader Kim Il-sung in 1994, and publicly announced at a party congress in 1980.